The world's smallest mammoth may have looked like a dwarf version of this full-size mammoth. The smallest mammoth known to have ever lived has been identified by Natural History Museum scientists, and is reported in the journalProceedings of the Royal Society B today. The extinct dwarf mammoth, species Mammuthus creticus, was around 1m tall, about the size of a modern baby African or Asian elephant. It weighed about 300kg, half the weight of the previous known smallest dwarf mammoth, M. lamarmorai. The fossils, unearthed in 1904 in Cape Malekas, Crete, have been re-examined and identified by the Museum's fossil mammal experts Dr Victoria Herridge and Dr Adrian Lister. Mammoths are elephants, and 'elephant' is the broad term used for all elephant and mammoth species, living and extinct. The identity settles a long-held debate about which part of the elephant family tree the Cretan dwarf belonged to. It was thought that the Cretan dwarf was most likely a descendant of the extinct straight-tusked elephant, Palaeoloxodon antiquus, because this was the ancestor of nearly all the other extinct dwarf elephants found on various Mediterranean islands including Sicily, Malta and Cyprus. But the new work showed that this was not the case. 'Our work has meant that we can not only show it is a mammoth, but also demonstrate it is the smallest mammoth known to have existed,' says Herridge. Mammoths had twisted tusks and a single-domed head. But it is an elephant's teeth that are most often preserved as fossils and these are used to tell elephant species apart. The teeth wear down during the animal's life, creating a surface with enamel 'rings'. 'The enamel rings on the Cretan tooth fossil had 3 character features that resembled mammoths, the genus Mammuthus, and, importantly, not the straight-tusked elephant Palaeoloxodon,' says Herridge. They compared the Cretan specimen to species of elephant known to have lived in mainland Europe in the past, the 3 mammoth species, Mammuthus rumanus, M. meridionalis and M. trogontherii, as well as P. antiquus. They also discovered new fossils of the Cretan dwarf mammoth from the original Cape Malekas site, located using the notes and diaries of pioneering fossil hunter Dorothea Bate who collected the original Cretan specimens in 1904. 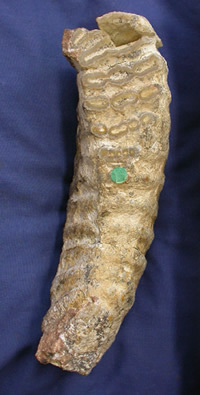 Cretan dwarf mammoth tooth fossil. Scientists identify different species of elephant by looking at the enamel 'rings'. A fragment of the humerus (upper arm bone) allowed the team to take a measurement of the total bone length so they could reconstruct the size of the adult mammoth as approximately 1.1m tall. The results showed the Cretan specimen was most similar to the species M. meridionalis that lived in Europe 2.5 million to 800,000 years ago. Dwarfism is a well-known evolutionary response of large mammals living on islands, known as the Island Rule (which conversely includes small mammals becoming larger). However, the Cretan animal was not only a dwarf, it was an extreme dwarf. Herridge adds, 'This is the first time that extreme island dwarfism has been shown to have occurred in mammoths'. The new research shows that such extreme island dwarfism has evolved in 2 lineages of European elephant independently (the other being the straight-tusked elephants). 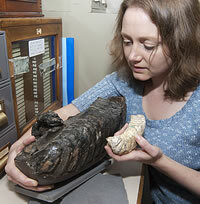 Dr Herridge with the dwarf mammoth tooth and a normal sized mammoth tooth. Lister explains, 'By showing that the Cretan dwarf was descended from mammoths, we illustrate an example of parallel evolution – two quite distinct lineages of elephant dwarfed in similar fashion on different islands. There is still much debate about how old the Cretan fossil material is, so the next step is to try and find out how long ago the dwarf mammoth was living on Crete. Herridge and other colleagues have already begun this work. Although they didn’t test for dates in this research, their results suggest M. creticus may have been there longer than previously thought. Herridge explains, 'I hadn't previously considered M. rumanus as a plausible ancestor because it was so old, geologically speaking, and so the evidence here has reminded me it doesn't do well to make assumptions in science!